Lyla is now in her forever home – updates to follow! Lyla is a 7 month old puppy, she came into rescue after her owner decided that Lyla needed a better life. She has been very much loved and cared for. 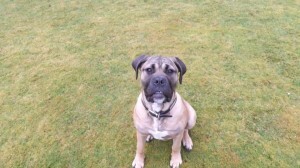 She is currently in foster with 2 other bullmastiffs and is getting along well. Lyla is a dominant girl so can be homed with a male dog only. She is great with people and children.